The first details about 3DMark11 have surfaced. 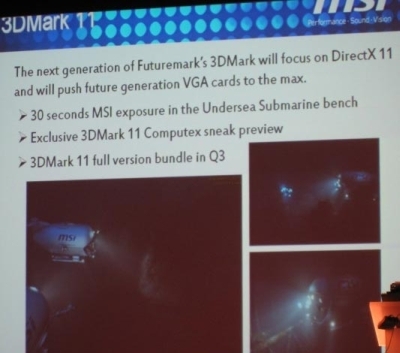 Futuremark’s gaming benchmark will be released in Q3, 2010. And according to the screeny (and some rumors over the Net), there’s no mention of PhysX and maybe 3DMark11 will rely on new GPU computing technologies such as OpenCL or DirectCompute to implement physics parts. I guess DirectCompute will be used since the benchmark is focused on Direct3D 11. And of course, this benchmark will use the hardware tessellation, one of the big features of DX11 class graphics cards like GeForce GTX 400 series or Radeon HD 5000 series. Yeah! can’t wait to see it on my GPUs! MSI again huh? These guys are taking the market by storm. Good for them. I wonder who will prevail in the physics tests, without the help of PhysX. If Nvidia does not win by a considerable margin, it will be a kick in the nuts! They will surely be faster in tesselation though, but by the time this bench comes out, the 6000 series will be out, so…! That’s great news that they decided to remove vendor-specific closed APIs.